Hi gang. 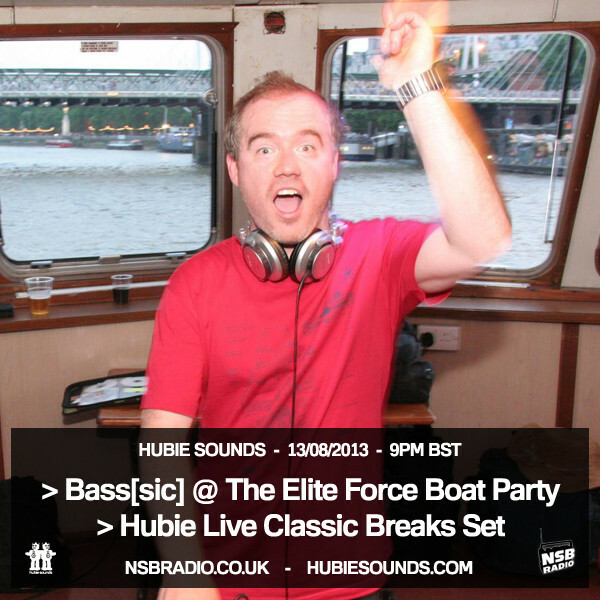 Hubie Sounds returns to the NSB Radio interwaves this Tuesday with another super exclusive set recorded live at last month’s sweltering Elite Force Boat Party! This time around I’ll be presenting a live set from the Bass[sic] room by yours truly, chock full of classic breaks by the likes of Lee Coombs, Stanton Warriors, Rennie Pilgrem & BLIM and loads more. As well as that boat party set, I’ll also be taking to the decks live in the studio with my usual selection of classic tunes and fresh new beats for your lovely ears. Hubie Sounds 071 – Tuesday 13th August @ 9pm BST – live and direct on NSB Radio! This entry was posted on 12 August, 2013 at 9:58 am and is filed under Live Radio. You can follow any responses to this entry through the RSS 2.0 feed. Responses are currently closed, but you can trackback from your own site.